When Ariana Lallone left Pacific Northwest Ballet after nearly 25 years, she took up a new career: dancing midair high above the dinner-theater audience, with a hoop as her partner. There’s more than one way for a dancer to fly. For nearly 25 years, Ariana Lallone lit up the stage at McCaw Hall as a member of Pacific Northwest Ballet (PNB), with her dramatic intensity, sky-reaching limbs (she’s 5 feet 11) and soaring technique making her an audience favorite. When her PNB career ended in 2011, Lallone knew that she wanted to keep performing. 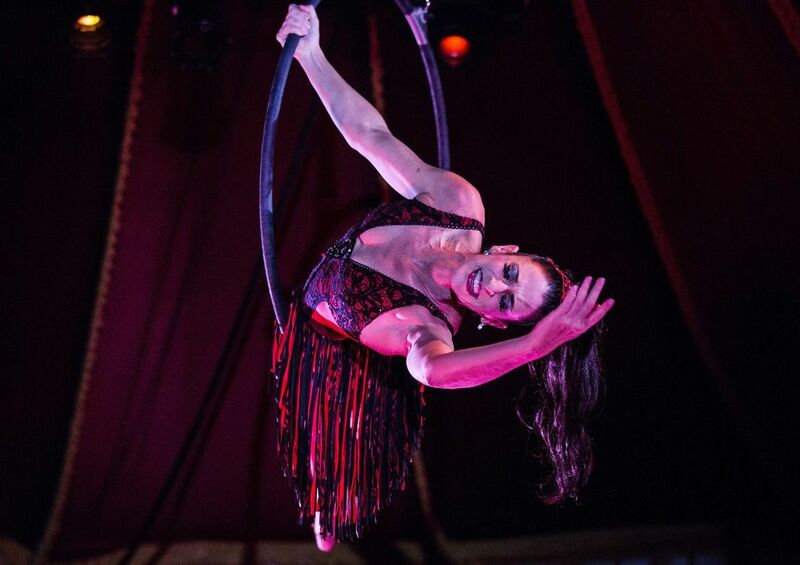 Eight years later, look up, and there she is — an aerial artist with Teatro ZinZanni, dancing midair high above the dinner-theater audience, with a hoop as her partner. Lallone’s seven-year association with ZinZanni began shortly after her final PNB performance — “literally the situation of when one door closes, another one opens,” she said. ZinZanni artistic director Reenie Duff, who had long admired Lallone’s work at PNB, approached her to play a ballerina role in “Bonsoir Liliane!” In the show, which opened in the fall of 2011, Lallone wore a red tutu, did some barre work and “very nervously” joined in the opening and closing song. That initial show whetted her appetite for more — she’d had, she said, “a little pipe dream” of performing in musical theater, and “going to work every day was just heaven.” But to have longevity at the boisterous, immersive circus that is ZinZanni, she learned, you need a specialty act. As a dancer, Lallone’s specialties were turning and jumping, and those moves aren’t possible on ZinZanni’s nine-foot circle of a stage. Enter the hoop, and a new artistic challenge. Not only was Lallone attempting to learn an entirely different physical vocabulary — at an age (in her 40s) when most dancers are beginning to do less, rather than more — but she needed to do it on her own terms, and quickly. 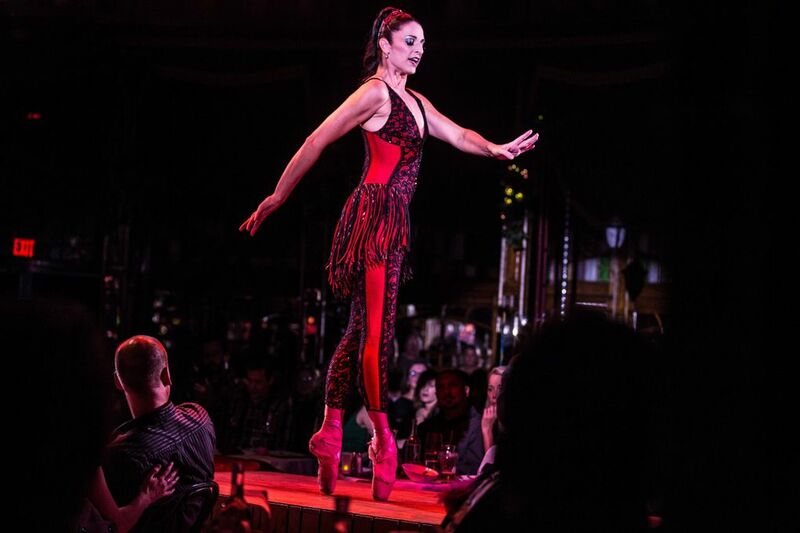 It took a year, she said, to choose the right music (“Bernini’s Angels,” composed by Kerry Muzzey), to develop an act with the help of Los Angeles-based aerial coach Lexi Pearl and “a village,” and to show it to the ZinZanni directors — a year in which she became a beginner again. “What I loved about learning it is that I felt like Lucille Ball,” she said, laughing, of her many early pratfalls. “You go to grab your hand on something and you just fall, because you can’t hold yourself up.” The accomplished ballerina was finding herself crash-landing on a mat, hair in disarray and chalk all over her face — but she was thrilled to let herself fall. Lallone premiered her new act in the 2013 ZinZanni production “Dinner at Wotan’s,” and has since performed it in “Hacienda Holiday” (2014), “Be Italian” (2016) and the current show “Hollywood & Vine.” With each iteration, “I’ve just been building and building my vocabulary and training, so that each time I’ve added more,” Lallone said. In “Hollywood & Vine,” she performs a breathtaking aerial act — those long legs, coiling and twisting and dancing with the hoop as she flies high over the audience, are as eloquent as ever — and zestfully plays a character on the ground: a brassy New Jersey girl named Gina Romanelli. As Gina, Lallone interacts with the audience, wandering through the closely spaced tables in the tent and chatting up the patrons, and she loves the intimacy and impromptu connections of those moments. Since joining ZinZanni as an artist, Lallone has developed her skills off the stage as well: She’s choreographed five ZinZanni shows as well as three children’s shows for the company, and teaches ballet barre at The Seattle Gym. But performing, she says, will always be her first love. Now 50, she still takes daily company class at PNB, and hopes to continue to dance — on ground or off — for a very long time. Those two families came together recently: On a Sunday evening at ZinZanni, PNB principal dancers Laura Tisserand and Lindsi Dec, joined by former PNB soloist Kylee Kitchens, came to the show. “I don’t really get nervous because I love (performing) so much,” Lallone said, “but I saw them and I just got this rush of nerves. I looked at their beautiful faces, and I thought, I’ve known these girls since they were 19.” The trio told Lallone afterward that they’d watched her for their entire careers, and that they were thrilled to still be able to do so.